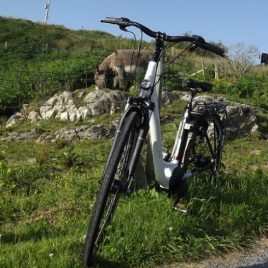 Bike Electric Connemara at All Things Connemara, based in Clifden on Market Street in the heart of Connemara, for all your Electric Bike Rentals and Tours. Making cycling accessible and less strenuous to all the public with the hire of pedal assisted electric bikes. Our electric pedal assist bikes have a range of 180km (540wh battery with lowest use, optimum conditions and a fully charged battery). For your safety, helmets and high visibility jackets are provided complimentary with the rental.